Preheat the pan dry roast the wheat rawa for few mins & keep it aside. Add oil in a pan, temper with mustard seed, ginger & chilles & add onion ,tomato & saute few mins. Add all vegetables to cook until half done, add water & allow to boil. Add salt & roasted wheat rawa, to mix well. cook until all water evaporates & the rawa gets cooked, serve hot with any chutneys or sambar. Wheat rava upma looks healthy and very tasty...I can eat it anytime.. 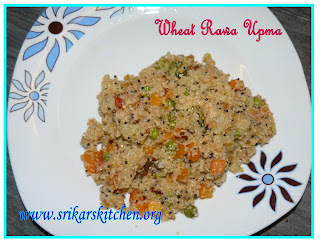 Wheat Rawa Upma looks delicious n perfect sripriya. Godumai Rawa Upma looks colorful. I make it very often. good and very healthy.. isn't it? looks very nice. Great Srikar, making whaet rawa upma. I can try this looks delicious to me. Upma looks delish, i prefer wheat over rava upma. Healthy wih a lot of veggies! I made the normal upma this morning...the wheat rawa upma looks so delicious. I love the texture of Wheat Rava.. :) looks good! Easy n quick as well as healthy upma Sri..love them with coconut chutney..
What a delicious and nutritious upma. Very nice indeed. I love these healthy recipes, and it looks great!